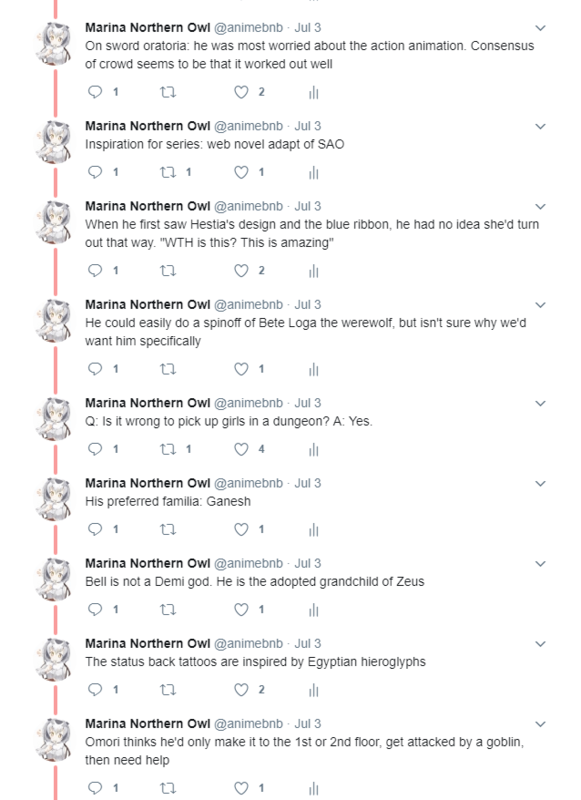 One of my favorite aspects of attending conventions is that chance to meet with people I usually only communicate with online, like on Twitter, in forums, or by blogs. Sometimes these offline meetings are impossible with competing schedules, especially if there are tons of interesting panels to attend, but luck was with me just a little bit this year. Many thanks to Crisu and his friend for going in on lodging with my husband and I via Airbnb. We had booked a place many months before the convention, only to be told the day prior to our arrival that the place was suddenly unavailable. Airbnb jumped to action and we had a replacement within hours and of equal distance to the convention. The four of us didn’t see each other much since they had premiere badges and were able to get in on a lot more panels than us, but what time we did spend chatting at the Kawaii Live and watching anime at the apartment was a lot of fun. I would definitely do this kind of shared space again. ISML was a community I spent a lot of my beginning anime years in, so it was great to see some of the oldies and a couple of people still going strong with the group, even if it was a brief meet-up. 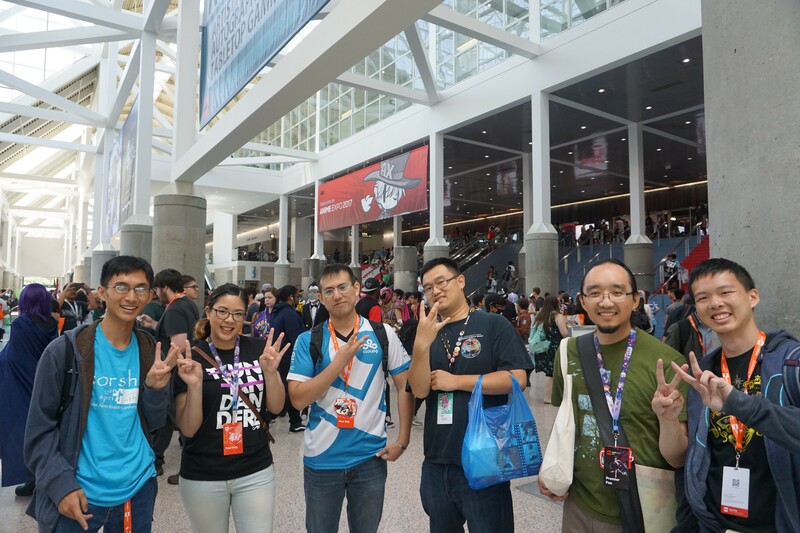 Thank you Blaz, Game, Kevo, Crisu, and Eater for taking the time to say hi and pose for a group photo! I bumped into fellow bloggers Avvesione and Flawfinder for the second time this year, the first time being at Sakura-Con. Thanks for always taking the time to say hello! I also reunited with zzeroparticle, who introduced us to his lovely wife. We reminisced about our wedding anime music and traded PNW travel info. I hope they both enjoyed the Super Live concert as much as we did! 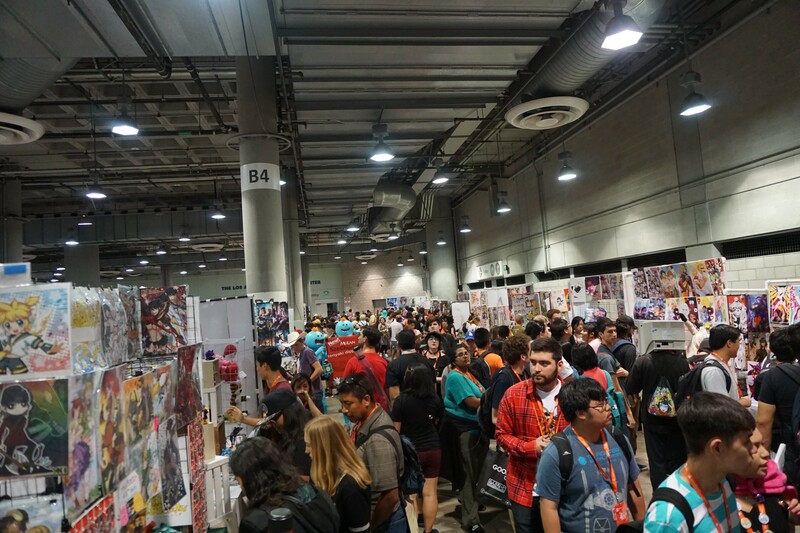 One of the driving forces to me coming back to Anime Expo after taking a four-year break was the news that the badge pick-up process had greatly improved. And it’s true–having pre-registered, I arrived at the intimidating line only to find myself almost constantly walking. It took us only thirty minutes, a vast improvement from some of my previous waits of two or more hours. This was on Day 0, when lines were still manageable. Another of my concerns was pick-up for the Anisong Maturi Kawaii Live taking place that same night. I hadn’t planned on going when I first booked my flight tickets, but since Crisu grabbed a couple of Premiere seats for us, I ended up arriving the same day as the concert after the deadline to grab tickets. Since we had arranged by E-mail to get them at a separate location, they were waiting for us once we had our badges. I thought there would be more people in the same situation as us, creating yet another long line just to get tickets, but that wasn’t the case. We walked straight up to the table and got our tickets within minutes. Day 0 lines flew by without a hitch. Day 1 was a completely different story. 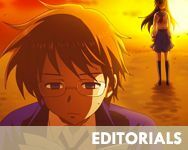 For full details of the disaster that ensued, check out Kotaku’s article. Even though we already had our badges, the line to simply enter the convention center snaked around the building twice for almost two miles. Some people waited four to five hours to get in, an unforgivable amount of time for people with only single-day passes. We were somewhat lucky since KWoo found a side entry with a guard allowing people to bypass the front lines. . The biggest obstacle to entrance can probably be attributed to the metal detectors at the main entrances. That process was made even worse by the fact that there was no convention or security staff at the heads of the lines directing people to the open doors. Walking around the building, we saw two or three free metal detectors. Anime Expo chalked the extra security up to increased need for safety, but I call bull on that excuse. Whatever security personnel they hired were either woefully unprepared for the mass of convention attendees, or misinformed. Day 2 and after improved on the lines by relaxing security to a laughable level. Many metal detectors were removed altogether, and bag checks consisted of bored guards merely glancing into the top and waving people on. I can’t complain for myself since I just wanted to get inside as fast as possible, but I find it odd that they couldn’t find a happy medium between the two extremes. Walking around the convention center itself was surprisingly easy. The halls and rooms didn’t seem as crammed as I remembered from years past, but that might be due to the slow entrance of attendees. The same cannot be said about some of the more popular panels. I go to cons for panels and guests, not for the Exhibit Hall, so getting into the ones that interest me really affect how I feel while there. At my local con, Sakura-Con, I can get into almost all rooms without problem since line-up always clearly starts thirty-minutes prior to the start time. There is no such designated line time at Anime Expo. Some people will show up two hours ahead of time, and it’s normal for attendance to be capped to room capacity. This means that even arriving an hour ahead of time doesn’t guarantee entry. You can also wait in line for that long and still be cut off once staff realizes the room will be too full, but they don’t tell you until after you’ve already waited your turn. I missed out on so many panels this year that were high on my priority list: Trigger, My Hero Academia, Ancient Magus Bride (I did make the screening), and more. I guess it would be in my best interest to invest in Premiere badges from now on, but I just can’t justify the huge price jump. I wish AX would keep count of people in line, maybe with clickers every half hour, and cap much earlier to people don’t waste their time waiting. Or perhaps, like Sakura-Con, prohibit lining up too early. Another issue I heard about involved Premiere attendees. With the obscene amount of money they spend, it makes sense that they have panel priority. Yet we heard of situations where Premiere members were prevented early entry despite having arrived before the designated ten minutes to start time–reasons ranged from “the premiere entry is capped” to “we filled the room early with both premiere and regular attendees.” There should be no limit to how many premiere people are allowed in a panel, and they shouldn’t be forced to go to the back of the regular line. Some adamant Premiere members had to pull up their terms to prove to AX staff that they had the unarguable right to enter given their circumstances. And if staff is going to allow early entry, they need to bar off a section of seats for Premiere. I can’t allow myself to buy into the higher level badge until these issues are fixed. We spent a record low at this convention, only purchasing one item from the Dealer’s Hall and a few posters from the Artist Alley. I also picked up an entire batch of used manga of Genshiken volumes 1-9 from a shop in Little Tokyo. Any other items like light novels, bookmarks, and pins were freebies from panels or booths. It was nice having the Dealer’s Hall and Artist Alley in completely different halls: Dealers upstairs and Artists downstairs. They were able to spread out a bit more and incorporate more booths. I was so focused on panels my first couple of days that it wasn’t until the latter two when I started taking cosplay photos. I’m still sad I couldn’t get a shot of any Kemono Friends cosplayers! There were female PPP and Serval cosplayers, but I never had the chance to see them myself. I did see some male Servals and Kabans, but…I didn’t want those photos! I didn’t expect Bandai to be our first panel since I’m not the biggest gamer, but I was interested to see any announcements regarding the Tales of series. Having just finished Tales of Xillia 2, I was excited to hear about Berseria and any other related games. 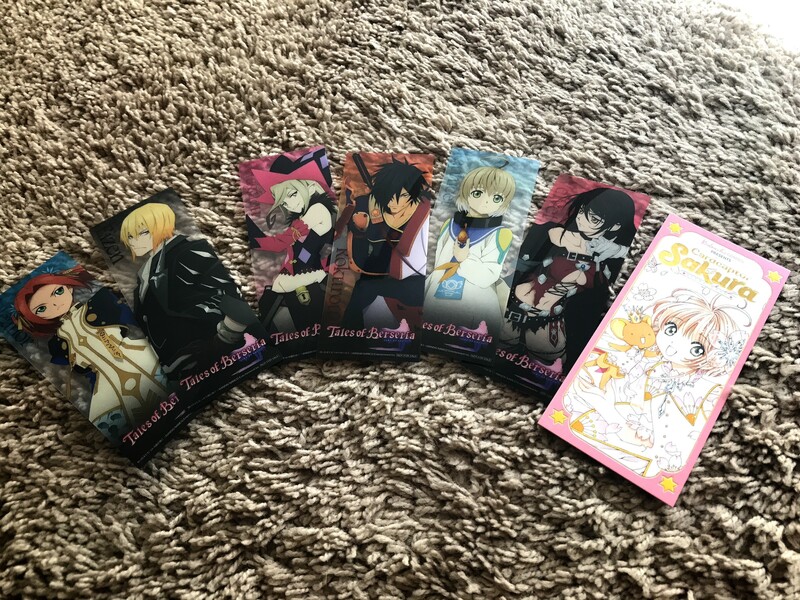 We received some really pretty Berseria bookmarks, and watched demo cut scenes and actual gameplay of the soon to be released Code Vein. This Dark Souls-look-alike includes character designs with a more anime style without sacrificing the overall gritty setting. 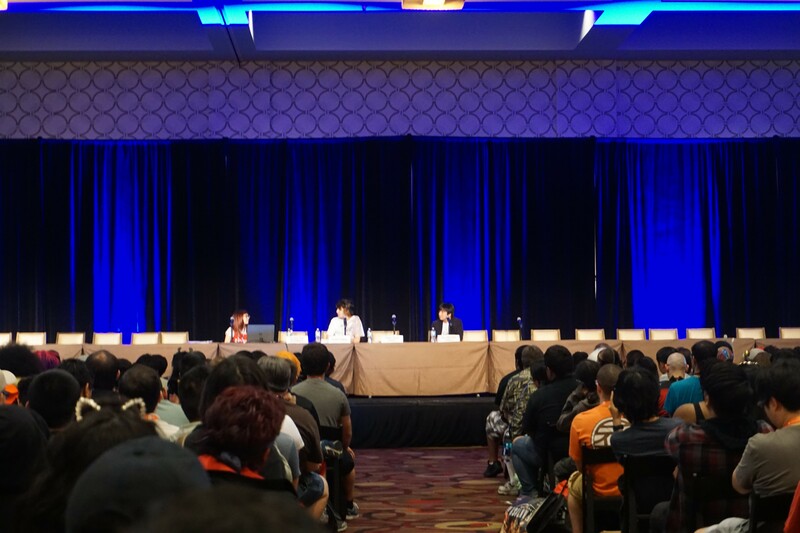 Producers Yasuhiro Fukaya and Yusuke Tomizawa did a good job keeping the momentum in the room going, and were only slightly hampered by the translator. English didn’t seem to be her first language, so she stumbled a lot on translating from Japanese for the audience. It also didn’t help that the producers spoke so far for so long that she had even more to work with each break. Seeing Cardcaptor Sakura: Clear Card on the schedule felt like fate since I had coincidentally just completed re-reading the original manga shortly before the convention. The events were still fresh in my mind. I didn’t encounter Cardcaptor Sakura until I first started watching anime back in my early college days, so I don’t have as strong of a feeling of nostalgia as other fans who grew up with the magical girl, but I do think of it fondly as one of my first magical girl anime. This screening included a full viewing of the Clear Card prologue, which actually covers the last chapter of the original manga where Sakura heads off to her first day of junior high. All attendees received a special bookmark with a promotional code to a free digital copy of Clear Card volume one through Kodansha’s Bookwalker app. This marketing tactic, seeing the prologue and reading volume one, really worked for me and has me more invested for when the series comes out. I’m also anxiously waiting for the next volume to be released. The writer’s goal to introduce a new generation to the charm and strength of an older Sakura doesn’t feel like a tired extension of the original work, but rather exactly what longtime fans want. As happy as I was with the original ending, I still want to see what happens after between Sakura and Syaoran. 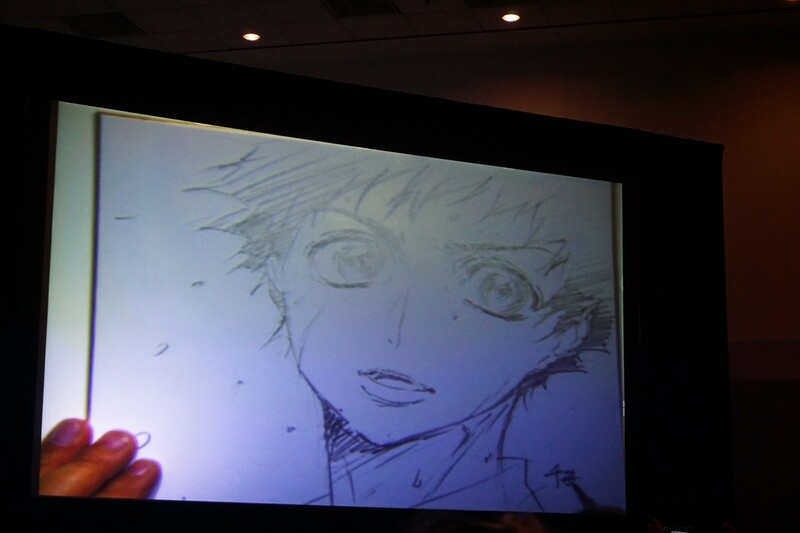 Welcome to the Ballroom was one of my highest anticipated shows of the summer 2017 season, so I was excited to see a couple of panels dedicated to the anime on the schedule, including this panel and live drawing, and a later screening of the first episode which I did not make. I don’t mind missing out on screenings much since I almost always struggle to see the subtitles over and around people’s heads, and I know I’ll be able to see it on my own time later anyways. The panelists treated us to some promotional videos for the anime, then proceeded to Q&A while three sign boards were drawn live for the audience. 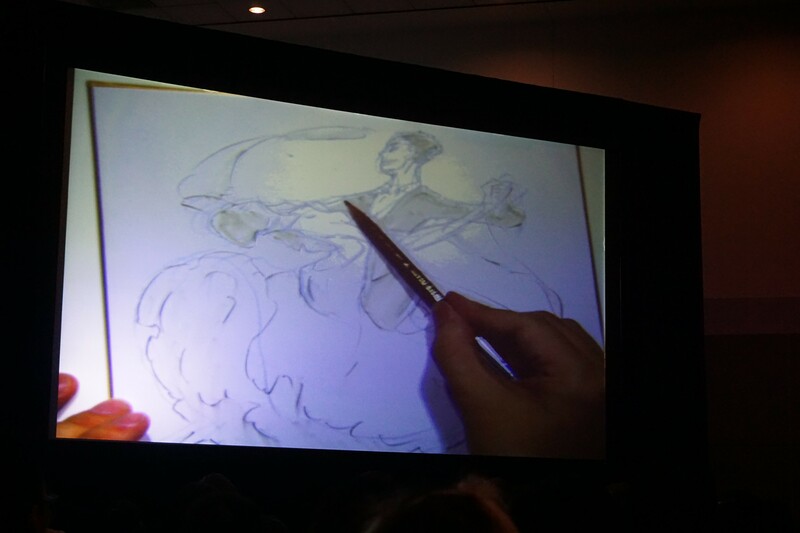 Having first encountered live drawings during this year’s Sakura-Con, I knew this would be one of my favorite aspects of this panel. Even more exciting, once the boards were finished, they were each offered to the audience in a game of rock, paper, scissors. As expected, staff did extensive research on ballroom dancing, including taking private lessons for six months and watching plenty of competition videos. You can easily see that research reflected in the smoothness of the animation and the positioning of the dancers’ bodies. I was sad to hear a lack of fervor in their voices about ballroom dancing–it was like they approached the topic as objectively as possible and didn’t fall in love with the art itself. I don’t imagine any of them continued with dancing outside of this project. This missing passion has me worried about the anime itself. I have no doubts that the art and animation will look great, and the story well written, but can’t see how they’ll be able to convey excitement to their viewers without feeling it themselves. I guess I’ll just have to see on my own when the show airs. Thanks to my husband’s love for X Japan, we attended this screening of their documentary. Yoshiki–composer, drummer, and pianist–was supposed to attend as well for Q&A, but he was unfortunately unable to due to surgery recovery affecting his current recording project. Regardless, this film exceeded my expectations. I knew next to nothing about the group, and was only familiar with the few songs I heard in the car. After hearing their story, I wanted to sit down and listen to all of their albums. Being a former pianist and percussionist myself, Yoshiki awes me with his talent and passion for performance. I still go on stage with a local community band, but that drive to improve myself is no longer there. He hungers for the light, for the gift of an audience to his music. Without spoiling the details of the film, which you should really see for yourself, Yoshiki overcame many obstacles to get where he is today, as did the rest of the members of the band. I didn’t know that not one, but two, of their members committed suicide (one is a contested accident). Their legacy as musicians reaches far beyond Japan, including many music artists here in the States. If the chance ever arises to see them in the U.S., I would love to jump at it. While I was unable to attend the panel including Q&A, I did see this screening, which included the first three episodes of the anime to air in the fall. I had already seen the two OVAs, but this was KWoo’s first viewing of the work. I arrived about an hour early, the longest I’ll allow myself to wait these days, and got pretty decent seats in the back half of the room. The subtitles were still blocked now and then by heads, but I was able to understand most of it. You don’t need to have seen the OVAs to watch the anime, but they do add nice depth to the characters and setting. My husband enjoyed the episodes enough to want to see the OVAs, so we will for sure watch The Ancient Magus’ Bride once it comes out in October. The magic and almost dark beauty reappear and we were immediately sucked into Chise’s world. I can’t place my finger on what it is that makes this work so popular with viewers, but the feelings is something akin to the wonder I feel when I watched movies like Spirited Away or Princess Mononoke for the first time. 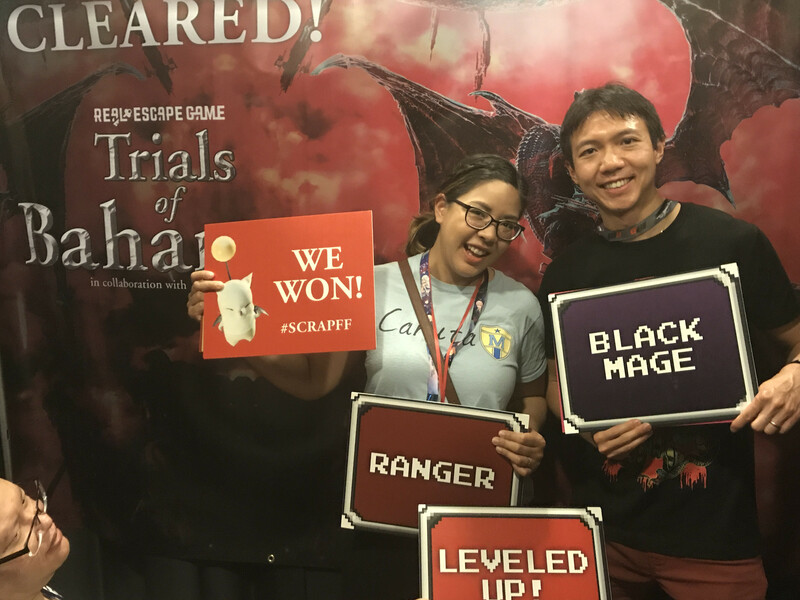 My friend Crisu really enhanced my experience at AX this year; not only did he get us the first night’s concert seating, but he also offered us tickets to the Trials of Bahamut Real Escape Game. I had completely overlooked the experience when going over the schedule, and thought it wouldn’t interest anyone who hadn’t played Final Fantasy XIV. When he offered us this chance and I saw our evening that day was empty, I figured it wouldn’t hurt to give it a try, and I’m glad I did! 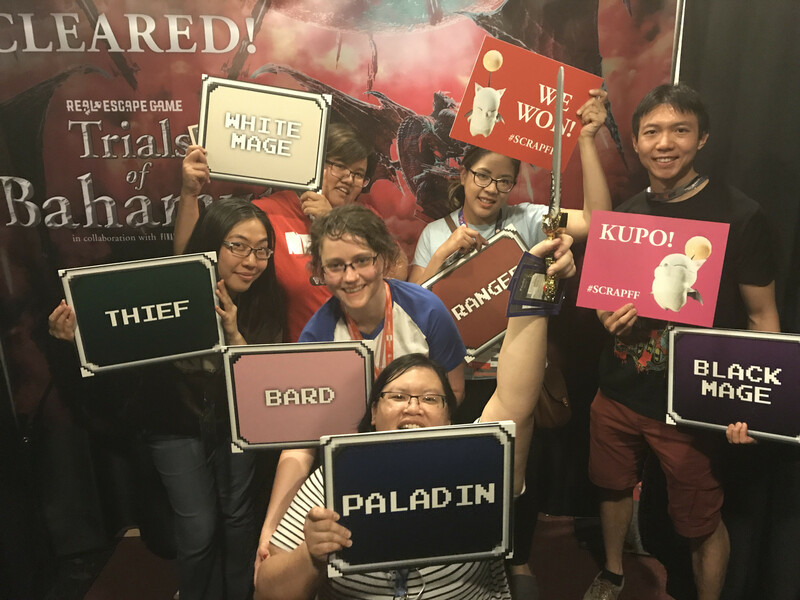 Trials of Bahamut was easily one of my favorite experiences at AX, with its interactive puzzles and theme. KWoo and I showed up and were teamed up with four other teammates who arrived together, one of whom is an avid player of FFXIV. We had done real escape rooms in the past, and thought this game would be a watered, less fun version of the locked room scenario, but it definitely stood up to scrutiny. Much of the puzzles were done at our table with paper and pencil, but there were sections of the room built up into areas like the item shop, underground passageway, and treasure room. The prop and staff acting were top notch and made it feel like we were really adventurers trying to save the world. With our team’s determination and know-how, we were part of the winning groups and got to take a winner’s photo with the victory backdrop. The game also included some cinematography showing us the results of our actions and the solution for those of us who didn’t win. Overall, I give this experience a 10/10. If you’re in Los Angeles right now, you can stop by Little Tokyo for Real Escape’s Attack on Titan themed game. While this DanMachi panel wasn’t first on my list at this time slot, I didn’t regret going since it was so well organized. The first perk was that the panel was headed by YouTuber Joey, The Anime Man. He also served as translator for creator Fujino Omori. 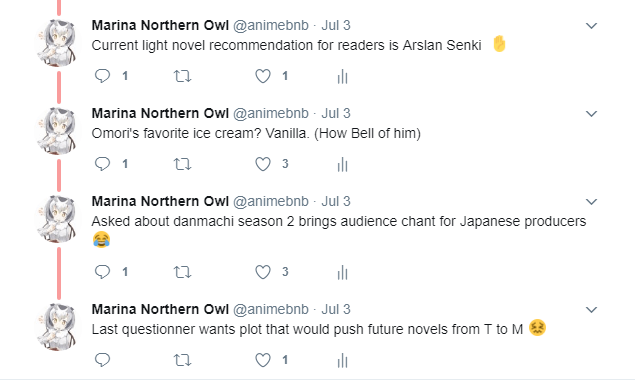 The second perk was that the questions were pre-selected from Twitter, and it appeared that Omori had prepared his answers accordingly. This meant that the lag between question and answer was virtually non-existent. Joey was also a great translator from what I could tell, with very little pause or repeat. Omori came out dressed a bit like Hestia in a white shirt and a blue neck ribbon. I ended up live tweeting this panel, since I found many of the answers pretty amusing. I don’t expect any sequels for either the original show or the spin-off, but there is plenty of room for continuations given all the hanging threads in both series. 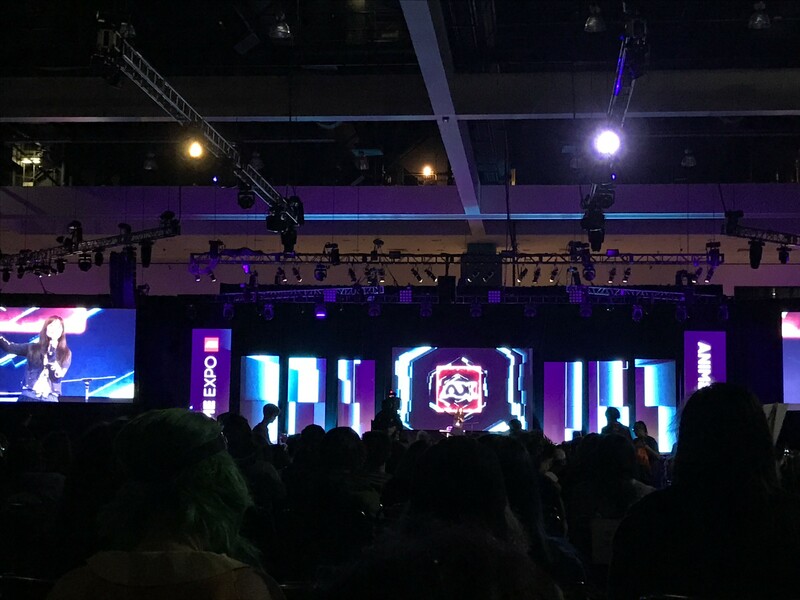 I’ve never attended so many music events at a convention before, and this particular one on Day 0 was unplanned until my friend convinced me with prime seats that it was worth going. 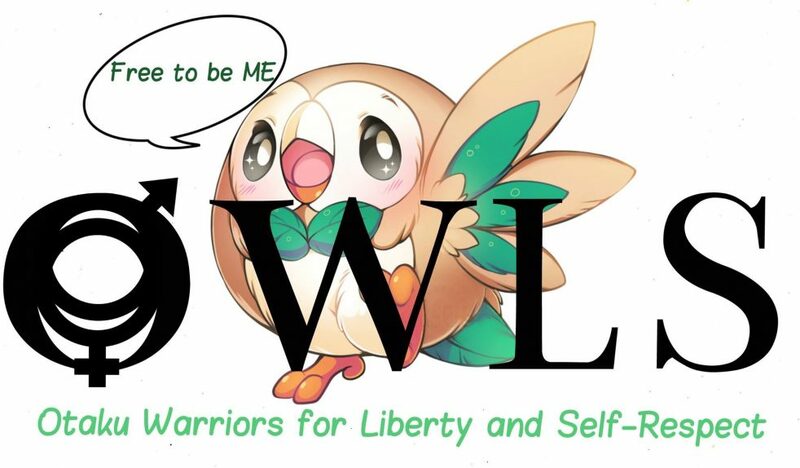 The theme of “Kawaii” included anime idols, specifically iDOLM@STER’s Cinderella Girls, Wake up, Girls!, Love Live!’s Aquors, and Walkure members Freyja and Mikumo. While I have seen all of these shows, KWoo has not. He does like cute girls in outfits like these, so I figured he’d have a lot of fun experiencing a show like this one. It felt a bit strange to have such great seats and not be dressed for the event. Everyone around us was decked out in happi of either entire groups or best girl, and wielding two or more premium glowsticks. Being novices, we enjoyed not only the performances on stage, but also the coordinated cheering of the fans. Following pamphlets on movements, chants, and colors to the letter, the audience was a unit of adoration for the girls. I’ll have to admit being slightly disappointed with the Cinderella Girls. Having brought only part of their crew, they hardly danced during their songs, preferring to sing while moving their arms and legs around as little as possible. WUG and Aquors both showed them up with impressive group dancing and even some acrobatics; they also exhibited much more convincing excitement. Walkure was by far my favorite despite not dancing any more than a singer’s standard movement and arm motions. The quality of their singing went above and beyond the other groups, and if I were decked out in a happi, it would be of them. The next night, we attended Super Live, which was a concert we planned to attend from the very beginning. We prefer this style of music more, and I was excited to see angela in person for the first time. I remember playing her debut song, the theme to my beloved Uchuu no Stellvia anime, on repeat. And, as expected, Super Live was our favorite of the two, helped in no small part by angela playing MC while dressed up as a lion for the other artists. Many of the singers also performed one or two collaborations with each other. Singers included ALI Project, Mashiro Ayano, Minori Chihara, GARNiDELiA, Konomi Suzuki, and angela. I can’t imagine receiving another chance like this to see so many amazing singers in one place for a single price. I hope that AX continues scheduling Anisong World Matsuri, since the performances alone make the trip and all the lines worth it. I’ll admit that we stumbled across Mari’s concert by complete accident. I didn’t attend the opening ceremony, and had overlooked her concert and panel. Since the concert was held in the same room as the Cardcaptor Sakura: Clear Card screening, we arrived an hour early and were treated to Mari Iijima singing at her keyboard. This nostalgia trip included her closing with “We Remember Love,” and I vowed to return to the Macross franchise someday. She was a gracious and down-to-earth guest, speaking with the audience casually like someone who has been there and done that and remembers what it’s like to be a fan. On Day 3, we went to Neon District, an EDM event hosted by Anime Expo featuring DJs from the U.S. and Japan. KWoo and I are not electric dance music fans; I never even went to raves as a teenager, and saw very little time in nightclubs. We were interested in the culture, so figured it wouldn’t hurt to attend just in case it turned out to be a surprise. Well, we now know we are not ravers. We also felt too old for the scene, with sweaty young people pressing up against each other. The hall was a bit too big for the group size, but you wouldn’t know that if you were with us in the crush of people next to the stage. I went away appreciative of two artists in particular: Japanese DJs YUC’e and Taku Takahashi. We found their style of music most diverse and unique. Their tracks didn’t sound like the same song on repeat, and they worked up the crowd really well with prompts and their own stage presence. They’re on SoundCloud if you’re interested in sampling their works; I find YUC’e particularly effective while writing. The biggest drags on Neon District were the security and beer garden. We were asked for our ID upwards of five times at all of the entrances and at the bar. We also waited for our drinks for at least half an hour. Thirty minutes for a single beer and rum & coke! I realize it takes time to mix out some of the more complicated drinks, but it would’ve been nice if the many bars had two lines separating beers and cocktails. Outside of my own city’s convention, Sakura-Con, I can’t think of another convention where I was so laid back. We were perhaps too relaxed. We didn’t set alarms, making sure to eat breakfast and grab coffee before heading to the convention center near lunch time. We also weren’t too concerned with trying to get into every panel on my list; I set a line limit of one hour which unfortunately crossed off a lot of opportunities. I found it more time effective to substitute waiting with cosplay photography or browsing the halls. We also made sure to eat three meals a day, sometimes walking a few blocks away to lesser trafficked restaurants. And like the oldies we are, we were almost always the first to roll back into the apartment at night. If I could go back, I might have set our alarms for a bit earlier in the morning, as well as sacrificed the Exhibit Hall for more panels. You live, you learn! 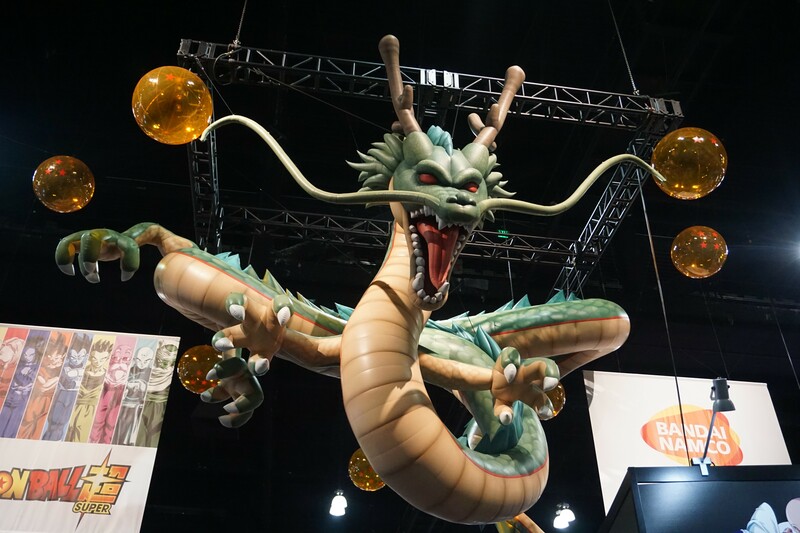 Anime Expo is currently our last convention of the year, though I am now considering Crunchyroll Expo in late August. The first of its run, the convention takes place in Santa Clara close to where my husband may need to travel for work. If all pans out, we might make a vacation out of it. Please let me know if you’re attending the con, and what you’re most excited about! 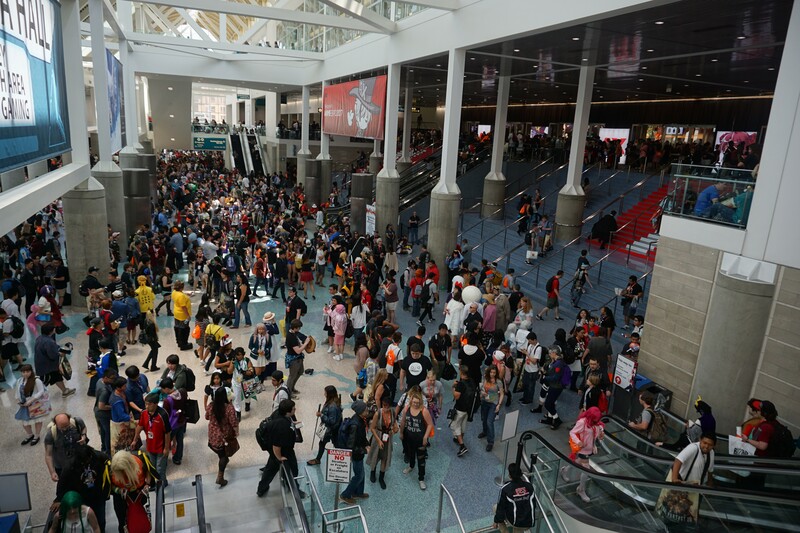 We probably will not return to Anime Expo until we hear of improvement in the overall line situation, or if a rare musician or guest is scheduled. 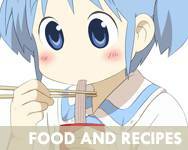 Smaller conventions are more our style, and I’d like to try ones like Fanime and Otakon. If you have a favorite convention I haven’t named, please do let me know so I can check it out. 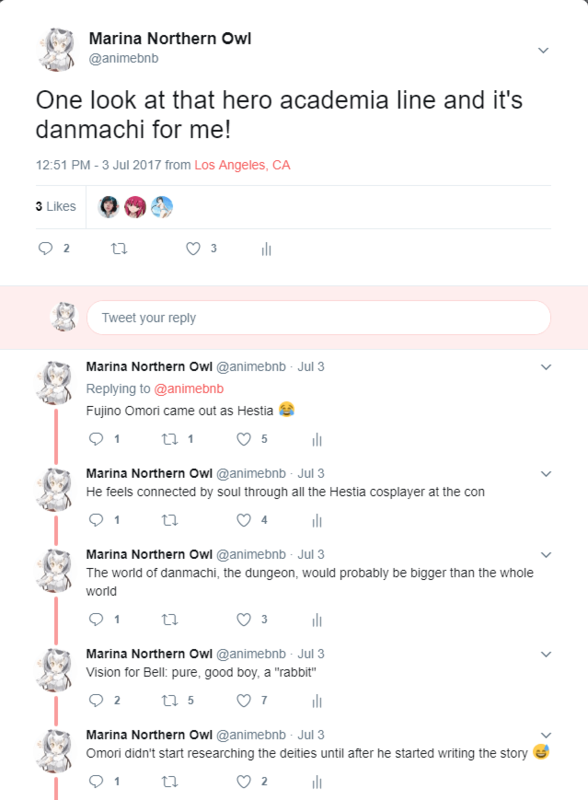 If you made it to the end, thanks for sticking it out and re-living Anime Expo 2017 with me! Click here to see all my AX photos. Am really cheered to hear so many reports regarding the CCS OVA … color me very interested!